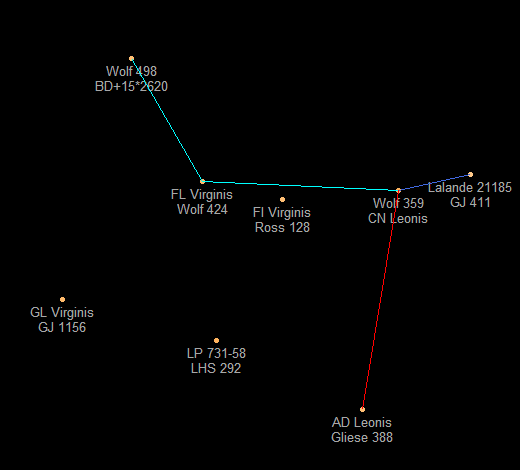 FL Virginis (Wolf 424, Gliese 473) - Binary red dwarfs (M5, M7) with a moderately eccentric orbit that averages 3.2 AU distance. The B star (the "true" FL Virginis; the designation is now routinely applied to the entire system) is a significant flare star and an astrogation hazard within 2 AU. The system is administered by the United Nations Space Agency and has a population of 19 (2137). Marble has a mildly eccentric orbit that averages a distance of 0.23 AU from the A star. The planet is 11 Earth masses and is an ice cloud Jovian. 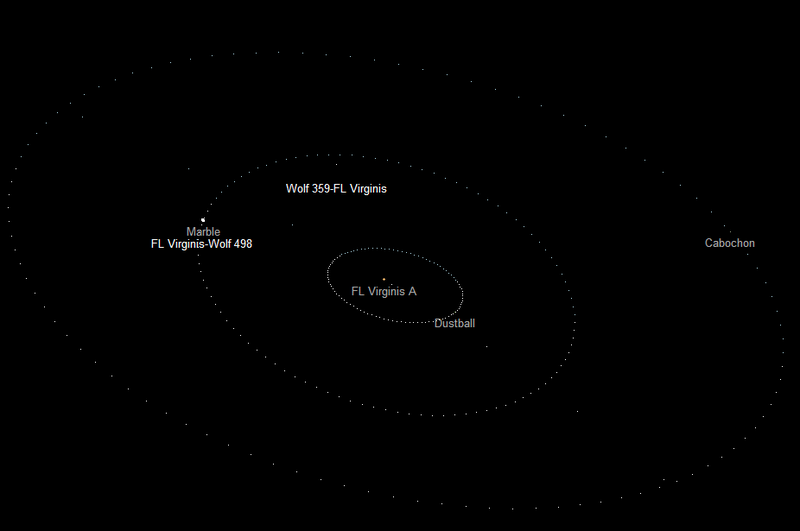 FL Virginis is chiefly noted as a transit star between Sol and the International Ring. It is two systems downstream from Sol, and three systems upstream from Entente (Beta Comae Berenices IV) and Commonwealth (Beta Canum Venaticorum IV). Some He-3 and deuterium extraction takes place at Marble to serve the fuel station at one of the planet's asteroid satellites.